SAN FRANCISCO, California, September 17, 2013 (ENS) – California Governor Jerry Brown met Monday with more than 50 California business, automotive, consumer, technology and utility leaders to advance public and private sector efforts to expand the state’s electric vehicle market. Organized by the California Plug-In Electric Vehicle Collaborative, the event, called Drive the Dream, was held at the Exploratorium, a museum of science and art on the San Francisco waterfront. Sixteen new plug-in hybrid and electric cars from eight automakers were on view outside the Exploratorium, demonstrating that electric vehicles are now available in all sizes and price points. 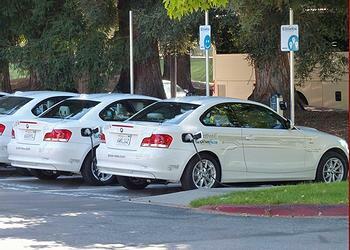 On display were the new BMW i3 and GM’s Cadillac ELR which go on sale in California in early 2014. Other popular cars at the event were: the Nissan Leaf, General Motors’ Chevy Volt and Chevy Spark EV, the Tesla Model S, Honda’s Fit EV and Plug-In Accord, Daimler Smart EV, Ford Focus EV and Fusion Energi, Toyota’s RAV4 EV, Prius Plug-In and iQ EV, and BMW’s ActiveE. 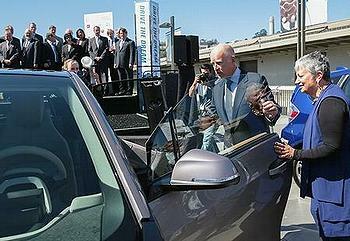 Governor Brown said he was impressed with how far electric vehicles have come in just a few years. Under Governor Brown, California has set the most aggressive clean transportation goals in the United States, including creating a charging network to handle one million electric vehicles by 2020. The event spotlighted new corporate commitments and partnerships to help grow California’s electric vehicle market and infrastructure. Companies such as Coca-Cola and Google promised to promote EVs with workplace incentives like free charging and car-sharing of plug-in vehicles. Walgreens plans to add 13 more charging stations at its drug stores across California. Business software company Intuit announced plans to expand its network of electric vehicle chargers at locations in Mountain View, Menlo Park and elsewhere. Bank of America announced a $3,000 incentive for its American employees to purchase a plug-in electric vehicle, in addition to a workplace charging program. The telecommunications company AT&T announced they will replace by September 2014 10 percent of their fleet passenger vehicles by purchasing 55 plug-in electric vehicles. Governor Brown announced that he intends to sign two key bills to support electric vehicles in California before the end of the legislation session. He will sign AB 8, which extends to 2024 programs aimed at reducing auto emissions in California, including: the Alternative and Renewable Fuel and Vehicle Technology Program, the Air Quality Improvement Program, the Enhanced Fleet Modernization Program and the Carl Moyer Memorial Air Quality Standards Attainment Program. The governor also said he will sign SB 359, which provides $30 million to fund the Clean Vehicle Rebate Project and the Hybrid and Zero-Emission Truck and Bus Voucher Incentive Project. This bill also provides $10 million to fund the Heavy-Duty Vehicle Air Quality Loan Program and appropriates $8 million for the enhanced fleet modernization program. This builds on the state’s efforts to help California’s electric vehicle market grow, including an Executive Order issued by Governor Brown in 2012 that established a target of 1.5 million zero-emission vehicles on the road in California by 2025. In addition to the commitments made at Monday’s event, California also supports electric vehicles by offering consumer rebates for pure battery electric and plug-in hybrid electric vehicles. And electric vehicles get access to high-occupancy vehicle lanes on California highways. The California government is supporting the state’s electric vehicle charging station infrastructure and developing permit streamlining guidelines for local governments to approve electric vehicle infrastructure. California also is amending the state building code to require that new homes and buildings are ready for electric vehicles and their charging systems. Finally, California is funding vehicle-to-grid pilot programs that allow EV batteries to provide electricity back to the grid when necessary.